Notes: Last night I reviewed A Little Sumpin Sumpin Ale by Lagunitas an oft cited example of a hoppy American Wheat Ale. Tonight I review another example of this style, Gumballhead, by Three Floyds Brewery. Three Floyds is a quirky, but highly regarded, brewery located in NW Indiana. Every once in a while you can find their beers in Columbus, but their availability is hit and miss, at best highly limited. 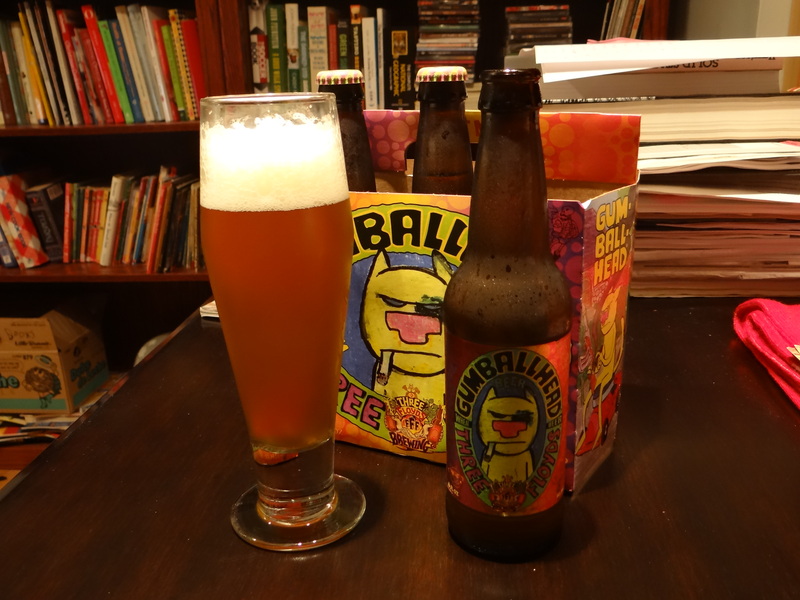 I recently picked up a 6-pack of Gumballhead in Indianapolis on the way home from the ACS meeting. Even then when I went into a beer store (Crowne Liquors) with a big selection of craft beers, and quite a few Three Floyds selections on the shelf, there was no Gumballhead to be seen. When I asked the clerk about their selection she said they might have some other selections in the back if I knew what to ask for. After striking out with Zombie Dust, I asked for a Gumballhead, and only then did she go in the back and produce a six pack. Gumballhead is named in honor of the underground comic book cat and is featured prominently on the label. Gumballhead is brewed with American red wheat and Amarillo hops. It pours a hazy amber color, a little darker than honey, with 2 fingers of pure white, fluffy head. Compared with Little Sumpin Sumpin Ale this beer is hazier, like you might expect for a wheat beer, but the head is not quite as impressive. The smell is not terribly strong, but there is a decent amount of floral, slightly spicy aroma. The taste is an interesting mix of the sweetness that comes from the wheat and the floral, citrusy flavor of the hops. The balance between the two is just about perfect, and the wheat takes away most of the bitterness that would come most beers with this level of hops. There are no clove or banana esters that you would get with a German Hefeweizen in this beer. The floral/hemp notes linger on the tongue for some time. Whereas in A Little Sumpin Sumpin Ale the hops and wheat clashed, here they complement each other perfectly. It would be particularly good as a thirst quencher on a hot day. It’s a hard to find beer, but if you ever have a chance to try Gumballhead don’t pass it up.